Keeping track of children while they play can be a thankless task - and it's just as true in the animal kingdom. Adorable footage has emerged of a baby elephant in Borås Zoo, in southern Sweden, who plays a bit too rough for his own good. He eagerly chases around two flocks of guinea fowl, who prove a bit too agile for the young elephant. 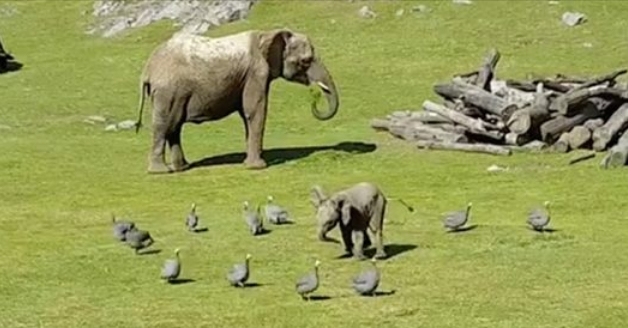 Nonetheless the eager elephant persists, chasing the birds around and around and around. At one moment he stumbles, clearly dizzy from having rampaged around in circles for a while. However he continues his futile chase before eventually tumbling over. At this point the mother, which has been dutifully watching from afar, lumbers over to check its baby is OK. The young elephant quickly gets up and retreats under its mothers trunk. Tuckered out, he then retreats away with his mother, clearly resolved to catch the birds another day. The short clip has gone viral, with tens of thousands watching it on Reddit. Responses to "Adorable Baby Elephant Takes A Tumble While Chasing Birds"